With the harsh conditions often experienced in Alberta, you need roofing products that will stand up to whatever Mother Nature can dish out. At Alf’s Roofing, we have the products and experienced installers to give your property the protection it deserves. By partnering with some of the leading manufacturers in the industry like IKO and Malarkey, we have access to highly durable products such as SBS laminated shingles. Your Edmonton home will benefit from this flexible and yet strong material, and with a Class 4 impact resistance rating, you may qualify for a discount on your home insurance. Known as a rubberized polymer, SBS stands for styrene-butadiene-styrene. This substance is blended with standard asphalt used in roofing shingles to give the final product a rubber-like quality. Essentially, the modified shingle is able to flex and resist damage when impacted by external forces such as hail. This technology has proven to provide superior impact, wind and water resistance. As added benefits, SBS shingles can be installed in lower temperatures and are shown to retain their surface granules better than traditional asphalt products. What Does Class 4 Impact Resistance Mean? Many SBS laminated shingles have earned a Class 4 impact resistance rating, the highest in the industry. Testing is done by independent laboratories and results in ratings from Class 1 to Class 4. In the test, a 2” steel ball is used to simulate hail and is dropped twice in the same spot from 20 feet above. The process is done in multiple spots and the shingle is then examined for such things as tearing, splitting, fracturing and cracking. While a Class 4 rating doesn’t mean the product is impervious to damage, it does mean the shingle has a much greater chance of withstanding extreme hail and protecting your home. 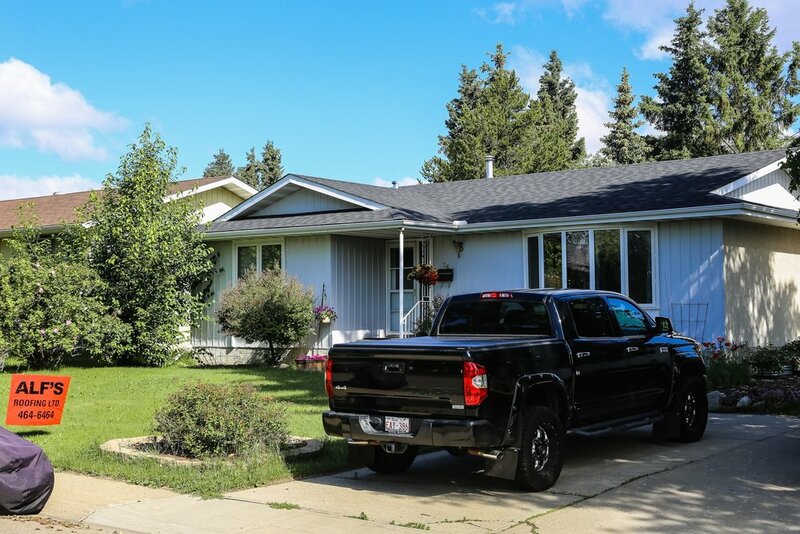 At Alf’s Roofing, we understand you want the best for your home, which is why we work with leading suppliers and install durable SBS laminated shingles in Edmonton and surrounding areas. Our dedicated, family-owned company not only installs industry-leading materials, we also ensure your job is done correctly by an experienced team. If it’s time to re-roof your property or if you have a new construction job, we are the name you need to know. We encourage you to read what some of our customers have said about our workmanship. If you’re ready to get started, request a free estimate by using our online form or simply give us a call to request service.